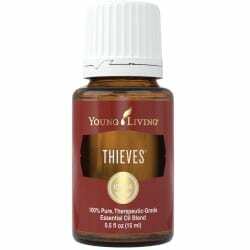 Thieves oil blend is a powerful combination of Clove, Lemon, Cinnamon, Eucalyptus Radiata, and Rosemary essential oils for an aromatic blend that fills any space with a rich, spicy aroma. Therapeutic Grade Essential Oils are only available from Young Living Essential Oils. Display all Young Living Oil Blends online from GF-Oils. Go here. Nothing feels and smells like Young Living Therapeutic Grade Essential Oils, for that reason, insist on them. Thieves Oil Blend was created based on research about four thieves in France, during the 15-century plague, who protected themselves with cloves, rosemary, and other aromatics while robbing plague victims. Thieves oil includes the benefits of cleaning power and an irresistibly spicy scent. Therefore, Young Living offers it as an essential oil blend. Furthermore, Thieves Blend is an important ingredient in a full range of home cleaning and personal care products. They range from dish soap to toothpaste. Looking to make your home smell as clean as it looks? Diffuse Thieves oil throughout the house for an aroma that makes every room smells fresh, instead of harsh cleaning formulas. Includes Clove, which was used traditionally as a spice for flavoring food. Add to food or beverages to enhance the flavor. Complement your favorite beverage by adding 1 drop Thieves to 2 drops Orange essential oil. Add 1 drop to a cup of warm water as part of a wellness regimen. Thieves® oil blend is an integral ingredient in many products. For dietary, aromatic, or topical use. When using as a supplement, dilute one drop in 4 fl. oz. of liquid such as goats or rice milk. Diffuse for short periods of time (1/2 hour or less) in the work or home environment. Possible skin sensitivity. If pregnant or under a doctor’s care, consult your physician. Always dilute before applying to the skin or taking internally. Keep out of reach of children. We Sell Only Young Living Essential Oils. As the world leader in essential oils, we believe everyone deserves a life full of wellness and abundance. Our vision is to bring the life-changing benefits of essential oils to every home, family, and lifestyle. Are you looking for essential oil enhanced personal care, home, and wellness products from Young Living? Then you have found the right place. First of all, GF-Oils.com has sold Young Living Essential Oil Products online since 1997. We invite you to explore our mission and offerings and see how Young Living enhances your life. occurring constituents limonene, eugenol, and eucalyptol, which may support a healthy immune system. Eucalyptus (Eucalyptus radiata) provides antioxidant protection and may improve respiratory circulation. Lemon (Citrus limon) Lemon consists of up to 70 percent d-limonene, a powerful antioxidant. It has cleansing and purification properties. Rosemary (Rosmarinus officinalis CT cineol) was one of the most broadly used plants throughout the ages. This oil includes the naturally occurring constituents eucalyptol and alpha-pinene.